Wow, you've really been holding out on me! You best make that cake next time we get together or else!!!!! That looks fabulously delicious Nic! Leave it to James Martin to come up with something so glorious as this. Of course, your execution and fabulous picture taking skills have only helped it to look even better! Nicisme, the cake is spectacular! Really beautiful, and I bet it tasted heavenly too! I actually really like the caramelized sugar drops around the top! Marie - Thanks! I really like some of the desserts that James makes, most of them are good old fashioned puds brought right up to date. Patricia - Thank you! The cream in the middle is really what makes this taste so good. Marye - Thank you! My son loved the caramel drops too, said there weren't enough - and my mum said they were 'too crunchy'!! Guess you can't win them all! Nic, congrats on the award, you deserve it, your site is great. The photos are always brilliant! I have the new James Martin book 'Desserts', it's full of old fashioned puds all with a modern twist! Great coffee table book too with great pictures! What a beautiful presentation!!!!! A very imaginative presentation for strawberries. It makes me want to get out there and bake!!!! Oh my goodness! 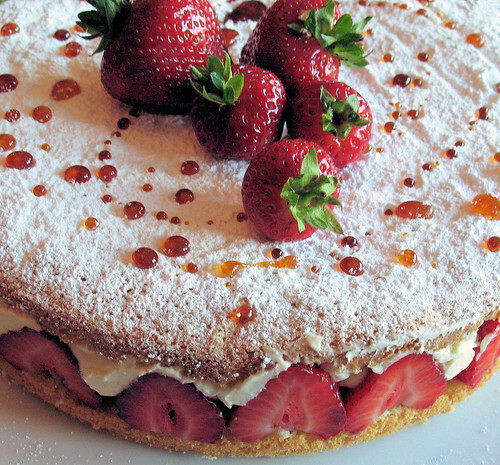 Recipe4Living is running a Strawberry recipe contest that is ending this week. Enter this recipe nowwww. It's amazingly gorgeous! I'm drooling, haha. There are some good recipes in that book for sure! Thank you Valli for your lovely comments! Hillary - sadly, it's not my own recipe to enter, but thank you anyway! i love it, it is beutifull that i can't even get my eyes of it it is so nice that i have to make it at home i love it. it is just nice james martin has a good mind to cook this!!!!!!!!! 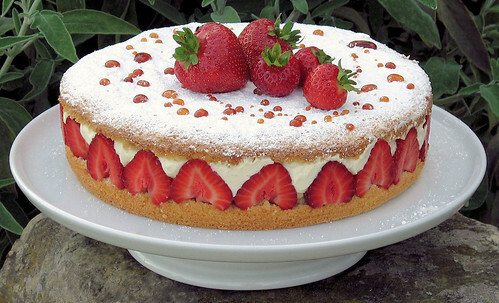 I must say that I think that your version of this cake looks far better than the one that James Martin made on the telly. Scrumptious. Thanks Bec. Your photos are super too, I didn't see any of the cake though. Your cake looks divine, much better looking than mine. Happy birthday to you!